Isometric City Quality stock images by Aurielaki. Set Vector illustrations in EPS10 EPS JPG AI. Set of isometric city buildings. Town district landscape with urban infrastructure streets and houses. 3D vector illustration. 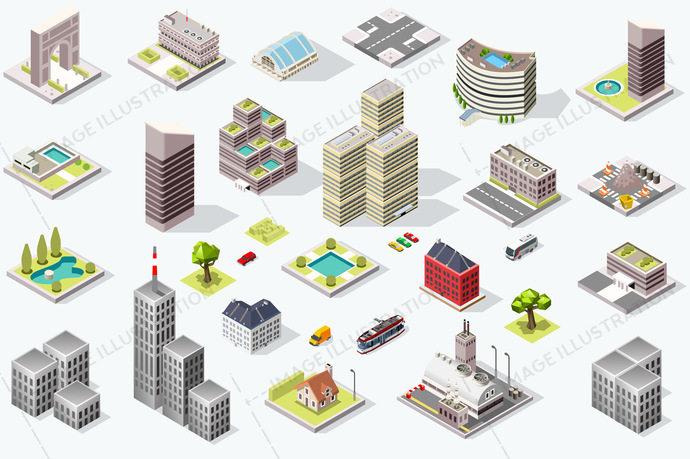 SKU: Isometric-City-Quality-Vector-Set-AurielAki. Category: Isometric City. Tags: 3d, architecture, background, building, business, cartoon, character, city, cityscape, collection, construction, design, element, employee, factory, forest, garden, graphic, group, hill, house, icon, illustration, industrial, isometric, landmark, landscape, meeting, modern, nature, office, outdoor, park, plant, scene, set, sign, skyline, skyscraper, street, symbol, technology, town, transportation, tree, urban, vacation, vector, view, white.